The Packers had eight picks on day 3 of the draft, and Brian Gutekunst used them in unique ways. The first-year general manager triple-downed on wide receivers and became the only GM to select both a punter and a long snapper in the same year (Bill Belichick and the Pats drafted a long snapper and a kicker in 2007). 1) I get the comparison. Last year, then GM Ted Thompson used three late round picks on running backs and this year Gutekunst used three late round picks on wide receivers. But that’s where the similarities end. Other than pass protection, running backs have a pretty easy transition from college to the NFL. That’s why so many of them excel as rookies, including Eddie Lacy for the Packers just a few years ago. The transition is much more difficult for wide receivers, especially ones who didn’t play in sophisticated pro-style offenses. That certainly applies to Missouri’s J’Mon Moore and South Florida’s Marquez Valdes-Scantling. That’s why the best hope for early success might actually be the last of the three wide receivers drafted on Saturday. 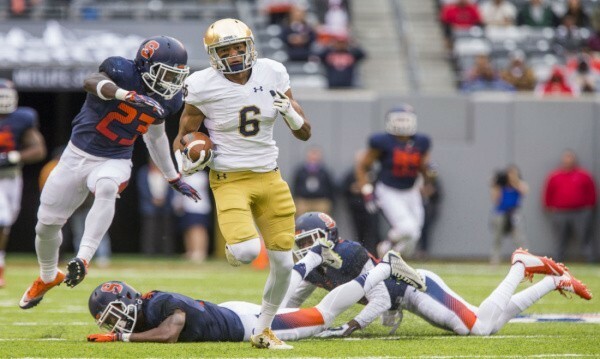 While Equanimeous St. Brown struggled last season playing without a capable quarterback, he looked like a potential high pick while catching passes from current Green Bay backup DeShone Kizer in 2016. More importantly, he also looked capable of making a relatively smooth transition to the next level. While the 2016 version of St. Brown was far from perfect – he still didn’t consistently win in contested situations and his routes weren’t always crisp – he did show good speed and explosiveness for his size (6-5, 215), which allowed him to create adequate separation. This made it very difficult to defend him on deep ins and crossing patterns. He also flashed the ability to make big plays down the field. That St. Brown – with outstanding coaching and a lot of hard work – has a chance to contribute right away in Green Bay. At the end of the day, it doesn’t matter which of the three rookie wide receivers steps up. It only matters that one of them does. Unless Gutekunst acquires a proven veteran in the next few months, there’s going to be an unproven player starting opposite Devante Adams when the Bears come to Lambeau Field for the opener. 2) I also get the comparison between JK Scott and B.J. Sander, but only because it’s pretty unusual to draft a punter before the sixth round. What makes this year different from what then GM Mike Sherman did in 2004 – besides Scott being selected two rounds later than Sander – is the talent of the two specialists. Scott has one of the strongest legs I’ve ever seen. It’s amazing how effortlessly he can punt a ball 60 yards. He also gets remarkable hang time on his boots – which more often than not makes his sometimes shaky accuracy unimportant. Sander struggled to kick the ball 40 yards. And while his directional skills were pretty good, that didn’t help when a punt from the end zone only made it to the 30-yard line. So while it’s completely fair to question the merits of ever taking a punter in the fifth round, it’s completely unfair to even think of comparing Scott to Sander. One has a rocket leg and one had a noodle leg. And one more thing – Gutekunst, unlike Sherman, didn’t trade up and give away an extra draft pick to get his punter. 3) I would be a little surprised if fifth-round pick Cole Madison doesn’t start at right guard this season. Sure he’ll have to transition from right tackle, but that shouldn’t be a big problem. The former Washington State star gets out of his stance quickly, uses his hands effectively, moves well in space and has a nasty streak – all things a player needs to succeed at guard in the National Football league. The 306-pound Madison does need to get a little stronger, but that could be said about 75 percent of college offensive linemen. Madison also has history on his side. Fellow college left tackles Josh Sitton and T.J. Lang made smooth transitions to guard after being drafted by the Packers in the middle rounds. Madison isn’t quite as powerful as those two players, but he’s a better athlete. He’ll also be taught by the same position coach, and James Campen has proven very adept at getting rookies ready to play. And more importantly, to play well. Other candidates vying for the job held by 35-year-old Jahri Evans last season include Justin McCray, Lucas Patrick and Kofi Amichia, who spent the season on the practice squad. McCray figures to open the offseason as the starter, but his best attribute is versatility, so the coaches would probably prefer for him to come off the bench. That could very well happen if Madison follows in the footsteps of those before him. ECT… Green Bay might have the tallest collection of wide receivers in league history. After Saturday, six players at that position are at least 6-foot-4. Poor Randall Cobb. He’s going to look like Danny DeVito in the meeting room… The Packers once again paid little attention to outside linebacker and tight end. The team still hasn’t drafted an edge rusher prior to the third round since Nick Perry in 2012. Gutekunst did grab Southeast Missouri State’s Kendall Donnerson with the last pick on Saturday, but he’s a longshot to see the field this season. And a tight end hasn’t even been selected since Kennard Backman in 2016…. Gutekunst signed 14 undrafted free agents as of early Sunday morning. The most intriguing might be Texas outside linebacker Naashon Hughes and Portland State corner Chris Seisay. Both players underachieved in college, but each has the skill set needed to play at the next level. It’s just a matter of finally getting the light to go on… Now that the draft is over, Gutekunst can concentrate on replenishing the depleted front office. The Packers have by far the smallest personnel department in the league following the departures of longtime executives Eliot Wolf and Alonzo Highsmith to Cleveland in January.